Poison Alphabet Soup: #TPP, #TTIP, #ISDS – Did You Check First? 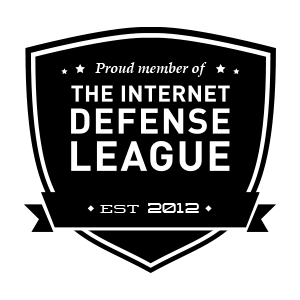 Imagine a dystopian future in which foreign corporations sue for and win millions and even billions of our tax dollars in damages while exercising incredible and corrupting influence over our elected leaders to change, overturn, or create laws that benefit companies at the expense of our safety and our liberties. Not to those paying attention to the alphabet soup of the TPP, TTIP, and ISDS. The people paying attention to international trade agreements being negotiated are warning us that the Trans-Pacific Partnership (TPP) and the Transatlantic Trade and Investment Partnership (TTIP) are going to do more damage to our economy than any trade agreements before them. That includes NAFTA, the North American Free Trade Agreement, which most people now credit (blame) for having put the final nails into the coffin of good-paying, middle class jobs in heavy industry and manufacturing in America. The people paying attention to the TPP and TTIP are warning us about the decision-making vehicle in these agreements called investor-state dispute settlement, or ISDS. ISDS, they tell us, puts all of the power about what is and isn’t legal into the hands of “investors” – the private, big money interests and the people running multinational corporations. The TPP and the TTIP with their respective ISDS provisions will mean that we citizens and the government officials we elect to represent us will be all but powerless to stop corporations from all but the most overtly heinous acts. That’s how ISDS is currently designed to work. Jim Hightower offers a thorough and plain language assessment of what is known about the risks of the TPP in his August Lowdown, “The Trans-Pacific Partnership is not about free trade. It’s a corporate coup d’etat–against us!” In this blog, Jim explains…. TPP is a “trade deal” that mostly does not deal with trade. In fact, of the 29 chapters in this document, only five cover traditional trade matters! The other two dozen chapters amount to a devilish “partnership” for corporate protectionism. They create sweeping new “rights” and escape hatches to protect multinational corporations from accountability to our governments… and to us. The issues left to corporations to govern over include food safety and GMOs, fracking, jobs, drug prices, and internet freedoms. The EU, to its credit, spelled out in their November 26th fact sheet, “Investment Protection and Investor-to-State Dispute Settlement in EU agreements”, what they see as the case for reforming investor protections as part of the Transatlantic Trade and Investment Partnership. In other words, when profits are more important than people. That said, and if the EU is to be believed, the document goes into some detail about how they want to protect the sovereignty of nations, allow citizens and NGOs to have a voice, and how they plan to incorporate financial disincentives to keep frivolous cases from being brought before tribunals comprised of people both parties must approve. This last point is of particular interest and concern to those watching the Obama administration and the US Trade Representatives: who will sit on the TPP tribunal that decides what corporations can and cannot do in a participating nation? Which brings us to this question. 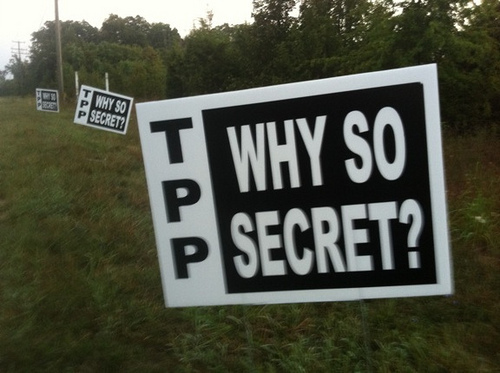 Where’s the Obama administration’s fact sheet on the TPP, and WHY ALL THE SECRECY??? Could it be that the president and the 600 or so corporations working on the TPP really are concerned about a backlash if Americans were to fully understand the TPP? What Can We As Citizens Do About It? Here’s a short list of resources and ACTIONS you can take right now! As always, please feel free to add to this list in the Comments, and please share this and everything else you can find about the TPP, TTIP, and ISDS on social media. We can still influence DC if enough of us speak up, speak out, and take action! 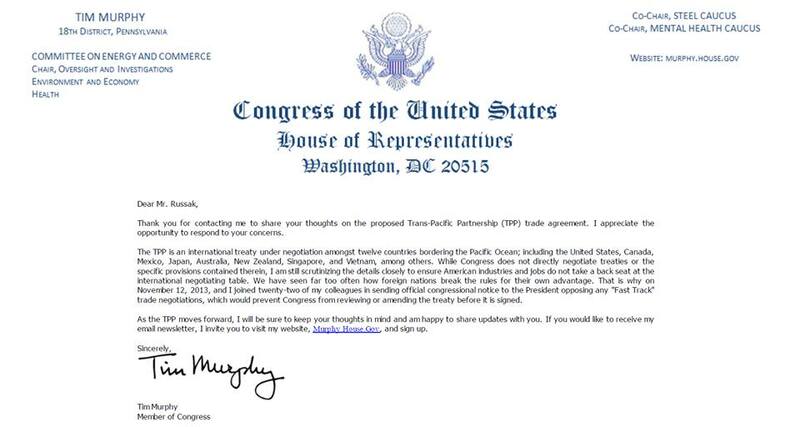 I still vehemently oppose him and will never vote for him, but today I will thank my Congressman, Republican Tim Murphy, for opposing fast tracking of the Trans-Pacific Partnership (TPP). His reasoning is wrong – we have far more to be concerned about from the big money and corporate takeover of this treaty and our government in general than we do from foreign countries breaking trade rules – but at least he’s on the correct side of the fast track issue for now. Pingback: Excerpts from “The Trans-Pacific Partnership Negotiations and Issues for Congress” | Did You Check First? Thanks, Bruce. I sincerely appreciate the kind words. Have a great day. It’s encouraging to see some in Congress taking a stand against Fast Tracking.